Design education in architecture and allied disciplines is the cornerstone of design professions that contribute to shaping the built environment of the future. In this book, design education is dealt with as a paradigm whose evolutionary processes, underpinning theories, contents, methods, tools, are questioned and critically examined. It features a comprehensive discussion on design education with a focus on the design studio as the backbone of that education and the main forum for creative exploration and interaction, and for knowledge acquisition, assimilation, and reproduction. Through international and regional surveys, the striking qualities of design pedagogy, contemporary professional challenges and the associated sociocultural and environmental needs are identified. Building on twenty-five years of research and explorations into design pedagogy in architecture and urban design, this book authoritatively offers a critical analysis of a continuously evolving profession, its associated societal processes and the way in which design education reacts to their demands. Matters that pertain to traditional pedagogy, its characteristics and the reactions developed against it in the form of pioneering alternative studio teaching practices. Advances in design approaches and methods are debated including critical inquiry, empirical making, process-based learning, and Community Design, Design-Build, and Live Project Studios. Innovative teaching practices in lecture-based and introductory design courses are identified and characterized including inquiry-based, active and experiential learning. These investigations are all interwoven to elucidate a comprehensive understanding of contemporary design education in architecture and allied disciplines. A wide spectrum of teaching approaches and methods is utilized to reveal a theory of a ’trans-critical’ pedagogy that is conceptualized to shape a futuristic thinking about design teaching. 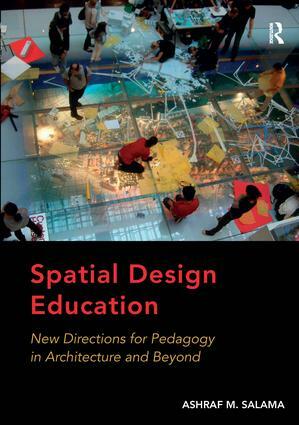 Lessons learned from techniques and mechanisms for accommodation, adaptation, and implementation of a ‘trans-critical’ pedagogy in education are conceived to invigorate a new student-centered, evidence-based design culture sheltered in a wide variety of learning settings in architecture and beyond. Ashraf M. Salama is Chair Professor in Architecture and Head of Architecture at the University of Strathclyde, Glasgow, UK.